I spent the last week at the 2008 NMRA Convention in Anaheim California having a great time going to clinics and touring layouts. 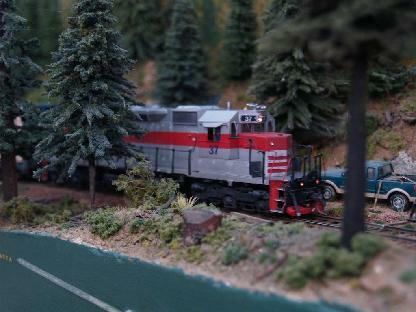 In this column I am going to feature one of my favorite layouts on the tour - Lee Christopher's McCloud Railway. This is an HO scale multideck layout in a two-car garage behind Lee's home in El Segundo, CA. 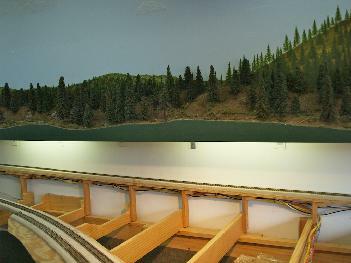 The are many reasons why this layout excited me - it has a high level of craftmanship, it is a good example of modern layout design with multiple levels and an emphasis on realistic operation, it had nice scenery and lighting, and it was very prototypical, being modeled after a short line in Northern California in a specific year, 1997. Lee graciously gave me permission to write a blog entry on his layout. You can see a Google map of the real McCloud Railroad by clicking here. 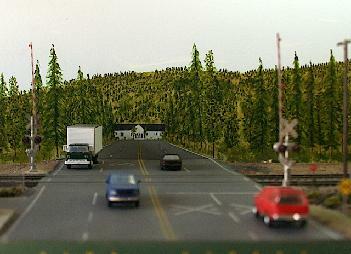 It interchanges with the Union Pacific (formerly the Southern Pacific) on the west end at the town of Mount Shasta and with the Burlington Northern Santa Fe at the east end. In the center of the railroad is the town of McCloud, the headquarters of the line. A branch line runs south to Burney. The railroad serves a number of industries and also runs passenger excursions. There is an excellent site describing the prototype McCloud here and its long history. 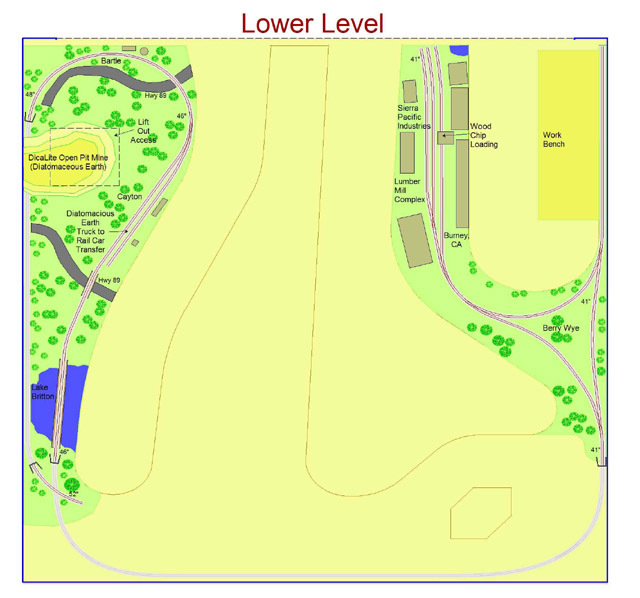 Upper Level Track Plan. The viewpoints of the pictures are noted. The upper level represents McCloud (center peninsula) with the connection to Mt Shasta (right side) and the switchback at Signal Butte on the left side connecting the two together. The lower level represents the line continuing on to Burney through Bartle and the Berry Wye. The track plan is a very good selective compression of most of the prototype. 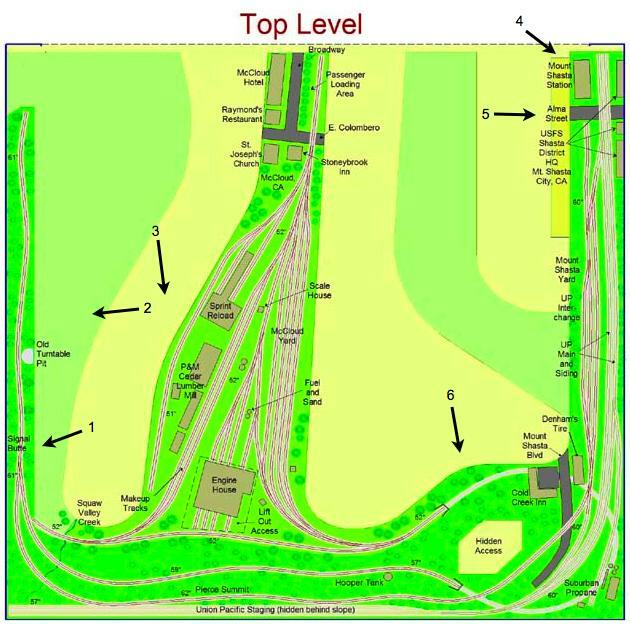 The only major feature Lee had to leave out is the branch towards the BNSF connection at Lookout. 2. Showing the muliple levels with Signal Butte tailtrack on top and the Bartle area below. 3. McCloud in the foreground with nice painting of Mt. Shasta on the backdrop. 4. 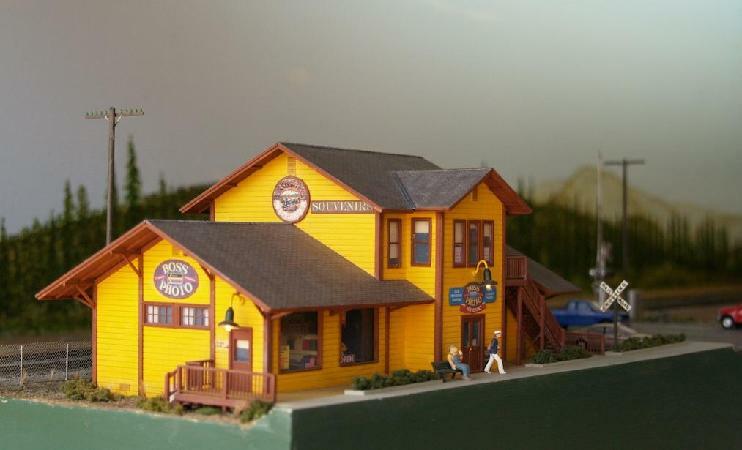 The station and souvenir shop at Mt Shasta. Watch the drop little guy! The layout shows a high degree of careful attention to detail and craftsmanship. All the track on the layout is hand-laid. The backdrop paintings are first rate. The color and texture of the scenery are a perfect match to the the prototype. Lee's friend Matt operated the layout for us and it ran smoothly. 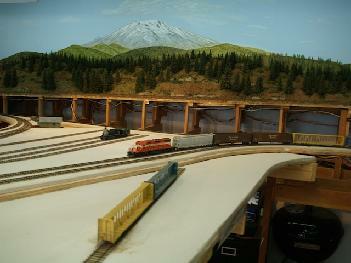 The layout was the focus of an article in the October 2007 Scale Rails and at the McCloud Rails website. I am sure you are going to be seeing this layout featured in the hobby press in the future. I thank Lee for opening his layout up for the NMRA convention tours and I look forward to seeing the layout some time in the future when it completed! 5. Alma street scene at Mount Shasta. 6. 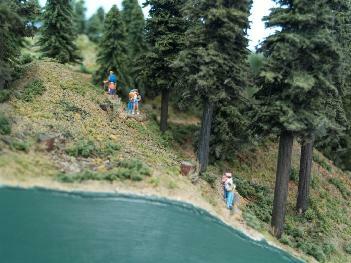 Hikers out railfanning the layout.